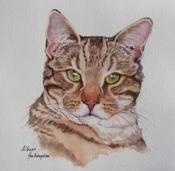 My pet portraits are a one of a kind keepsake for you to enjoy for years. I paint from your quality photographs. 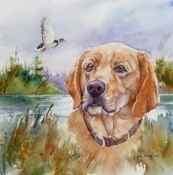 I can change the background to capture the pets personality, like the hunting lab portrait. 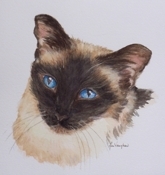 Your portrait is painted on 140# archival quality watercolor paper. Completed pieces are mounted and wrapped, ready for framing. ~ 8x10 "full body" pose with background ~ $125.00. 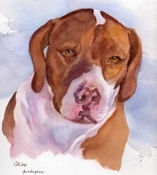 ~ 11x14 "Head Shot" color wash or white background ~ $150.00. ~ 11x14 "full body" pose with background ~ $175.00. ~ 50% deposit is required. Balance due upon completion. Allow 6-8 weeks for completion. Gift Certificates available.The perfect gift for the person who has everything and a very special surprise to treasure! ~ Take a quality photo with good lighting. It will make it easier for me to catch all the details for your finished painting. ~ If the eyes have a "flash" glare in the photo you like best for the painting, take a few close ups of the eyes for reference. ~ Please let me know your favorite pose if you send several photos. ~ Originals Photos will be returned. Photos can be sent as an e-mail attachment. ~ The photographer should hold treats or favorite toy to get your pets ears up and alert look. ~ Take a few close ups of your pet. If there are multiple pets, please take a few photos of pets together to show size variance. ~ What can I say, you are at their mercy. Keep a camera close at hand. It is best to let them be themselves and wait until they are in a nice relaxed moment. ~If you're not in a fully lit area, be sure to use a flash. This is my little guy! He is a Cockapoo. Abby and Riley are our family cats. They would sit and watch me paint, (more interested in the water that I dipped my brush in). One day, I decided that it would be fun to paint them! 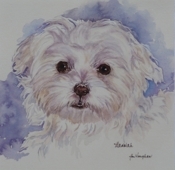 That was the start to my love of painting pets. Abby is no longer with us. She lived to be 17yrs. She was a stray kitten found on my sister's farm. I am so happy we have lots of photos of her, and that I decide to paint her.